Hay is used to feed for cattle, horses, and sheep. It is made of the dried stems and leaves of plants. There are many different types of hay. Some of the best crops to use for hay are wild prairie grass and alfalfa. Others include clover, rye, barley, oats or velvet beans. Montana is ranked eleventh in the nation for total hay production and ninth for alfalfa hay. Alfalfa and alfalfa-grass mixtures account for about 75 percent of the state's total. It is produced on approximately 1.25 million acres. Alfalfa is very high in nutrients and energy. It must be planted about every six years in order to maintain a good crop. It is usually irrigated, unless it is grown in a high moisture area. Grass hay may be irrigated, starting in May. There are different ways to irrigate. Some people use the flood system, in which they place dams in ditches and let the water run over the field. Others have huge sprinkler systems which are moved twice a day to cover the field. Most of Montana's hay is produced in central Montana. A large amount is also produced in southwest and southcentral Montana. 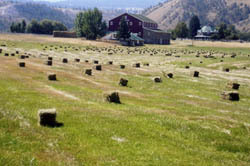 Most ranchers grow their own hay and keep it for their own use. If they have some leftover they will sell it to other producers, either within the state or to other states without enough feed for their livestock. For example, when Texas had a drought Montana producers sent thousands of tons of hay to the state of Texas. Haying involves many steps. First, it is cut down and made into windrows with a swather. These windrows lay on the ground to dry. If the weather is hot and dry, they can be left to cure naturally. However, if the windrows get wet or are not drying fast enough, they must be raked or fluffed, with attachments on the tractor. These rakes or fluffers flip the hay over to allow the other side to dry. When the hay reaches the correct moisture percentage, it can be baled. If the hay is baled too wet it may ferment and build up heat, causing the bales to catch on fire. There are different types of balers. Some make small square bales weighing about 70 pounds. These were the primary type of bales for a long time, and were very labor intensive. They had to be picked off the field by hand and hand stacked. They are used mostly for horses, or if an animal is being kept in a pen, as their small size makes them handy to haul around. For cattle, most ranchers put up huge round or square bales weighing as much as 2000 pounds. These are handled entirely by machine. The hay is carried off the fields, after baling, with trucks and tractors and stacked. The rancher now has a food supply to carry his animals through the winter. In Montana the cattle are usually fed from late November to April, during the time there is snow on the ground. One cow will eat 2 percent of her body weight each day, so if a cow weighs 1200 pounds that means she will eat 24 pounds of hay a day. Can you imagine consuming 24 pounds of food in one day? Horses that are kept inside are fed hay all year. A horse will consume up to 3 percent of its body weight per day. So if a horse weighs 900 pounds that means it will eat 27 pounds of hay each day! Every year Montana hosts What the Hay, a festival that features creative hay bale sculptures. 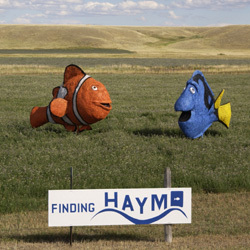 These sculptures are displayed in central Montana in fields between Hobson and Windham, with the town of Utica as the midway point and center of What the Hay activities. Locals and visitors peruse the various hay bale masterpieces and check out the small towns of Hobson, Utica, and Windham that along the way. After everyone's had a chance to see the hay bale displays, hay arists and onlookers gather for a big barbeque and vote on their favorite displays. 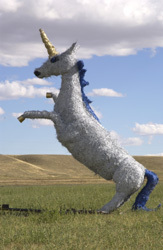 Past displays have included a mechanized, musical Jack-in-the-Bale, a brightly colored Cook-Hay Monster, a Unicorn constructed out of hay, and two Finding Hay-mo fish. The thousands of people attending the festival cast their votes and hold an awards ceremony the next day at the Oxen Yoke Inn in Utica, where the winner is announced. Although local farmers and ranchers make up the majority of the sculptures, there have been entrants from all parts of Montana as well as other parts of the US. Plenty of kids enter their hay bale sculptures in What the Hay each year as well! Thank you to Agriculture in Montana Schools for providing much of this information.